Figures released earlier this year from the Equine Injury Database suggest the number of racing fatalities in the United States is falling. For the fourth consecutive year, the rate of deaths per 1,000 starts was down, coming to 1.54 after weighing in at 2.00 when the database started recording data in 2009. No matter where you stand at the racetrack, a catastrophic breakdown is horrendous, and the horror is compounded for people with a direct connection to the horse. But out of tragedy can come important lessons. Eight Belles' high-profile death in the gallop-out of the 2008 Kentucky Derby is referenced so often as an impetus for change we included it in our Regulatory Meeting Bingo Card last summer. At many tracks around the country, commission or track officials and trainers are attempting to use each racetrack fatality as an opportunity to learn. In most places, when a horse dies during a race or during morning training, its body is submitted for autopsy (called “necropsy” in animals) to gather information about possible causes of death or fatal injury. These examinations typically include both physical exam of the bones and soft tissues, as well as toxicology and histology tests on organs and, if applicable, on blood drawn before euthanasia. Radiographs may be taken of fractures as well. The job of the veterinarian performing this process (typically a board-certified pathologist) is to be objective and thorough. The pathologist is not there to make interpretations or to speculate on the horse's medical or training history, as they are not provided with that information. Dr. Laura Kennedy, veterinary pathologist at University of Kentucky's Veterinary Diagnostic Laboratory, says she makes sure to look both at the fracture site and the corresponding area on the opposite leg. Some pathologists take photos of any unique findings or fractures; Kennedy has taken to making sketches of what she sees to go into the horse's file. One thing she's not there to do is recreate the scene of the breakdown. In states requiring necropsies for on-track deaths, the pathologist sends a copy of their report to the commission. Then, in some places, a mortality review will take place between racing officials and horsemen. 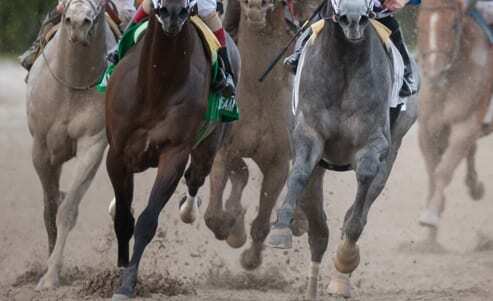 All tracks accredited by the NTRA Safety and Integrity Alliance conduct some form of official review when a horse dies on the racetrack; the formality of the review and parties involved varies by location. In Kentucky, New York and California, the process of mortality review is mandated by the racing commission. In other states like Pennsylvania, mortality review is not mandated by state rules, but is part of “house rules” at each racetrack. In Kentucky, the commission meets with the trainer to review the necropsy report, veterinary treatment records, workout records, and race records. Dr. Mary Scollay, equine medical director for the Kentucky Horse Racing Commission, said the tone of the meeting is not disciplinary, but as a group quest for understanding. Dr. Jerry Pack, association veterinarian at Penn National, instituted that track's mortality review program in 2010 and agrees trainers have been receptive to the process. At Penn, Pack meets with the trainer, the racing secretary and director of racing, and administers a questionnaire to better understand the horse's medical history. He combines the trainer's answers with the necropsy report to try to arrive explanations for what happened with the horse. Besides having the benefit of giving involved trainers specific continuing education-type sessions, logging and reviewing necropsy reports also gives tracks and states localized caches of data to work with. The Equine Injury Database records data nationally from approximately 96 percent of flat racing dates in the U.S., and has begun identifying risk factors for fatal injury based on its data. Some of the areas with longer-running necropsy and review procedures have also been keeping their own records. California officials have been gathering data on necropsies for Thoroughbreds since 1990. At Penn National, Pack has a database of 600 necropsy reports dating back to 1997. Some of that data has already affected track policy. California's program at University of California-Davis helped identify long toe grabs on horseshoes as contributors to likelihood of fatal injury. As a result, the majority of racing states have restrictions on maximum height for toe grabs, with most being restricted to 2 millimeters. This information has also helped researchers realize the majority of fatal orthopedic injuries take place in areas with preexisting damage (which prompted the installation of a nuclear scintigraphy machine at Santa Anita Park in the mid-1990s to help identify such damage). Just as importantly, Kennedy says, it has also taught veterinarians damage may be symmetrical in certain types of fractures. The catch, Scollay said, is this means a horse with preexisting damage may not necessarily be what we traditionally think of as “lame” and may not bobble from one side to the other. Instead, a horse with some wear and tear damage in both front legs may simply take shorter steps, which a trainer who's unfamiliar with the horse may not recognize is unusual for the individual. Kentucky's mortality review process has also served to remind its racing commission of the disparity sometimes existing between breaking news from the EID findings and horsemen who need that information. Scollay said although the EID has identified horses who have made a start as 2-year-olds carry a reduced risk of fatal breakdown, she still encounters trainers who waited to start oversized horses, believing they're keeping rapid growers safer. “No matter how much we think we've gotten that word out there, people say, 'She was a big gangly filly and I just wanted to give her a chance to grow into herself before I started training her.' The fact that we know that's not good, that doesn't mean it's getting into the hands of people who need to hear it,” said Scollay. “And those are the people who are sobbing [in the review], because they thought they were doing the right thing. Regardless of the fact that info has been out for 20 years, if it's not getting to that person,” Kennedy agreed. Then, there are the mortality reviews which show not all fatalities can be prevented. Dr. Rick Arthur, Equine Medical Director for the California Horse Racing Board, recalled one case in which the pathologist discovered a section of bone that had been eaten away from the inside, possibly due to an old infection, but the location of the hole likely prevented it from ever showing on an x-ray because of nearby soft tissues and a joint capsule. In Kentucky, Scollay remembered an instance from decades ago when a trainer who spoke limited English came to a review for a horse whose body had been presented to the Kentucky diagnostic lab in poor condition. It would have been easy to assume intentional neglect, but it turned out the trainer was feeding a multi-species complete feed with chopped hay in it because he couldn't read the feed tag well. He was aware the horse was losing weight, and kept increasing the horse's ration, administered wormer, and had the horse's teeth checked. The horse was eating well, and he had been distressed the animal wasn't doing better. It wasn't until the review board met with him and a translator everyone realized the horse's problem was the content of the feed, not the amount it was getting. The review process allowed the trainer to get the help and resources he needed before he was able to make the same mistake with another horse. Also in the file of “troubling discoveries”: not all localities are lining up well with the risk factors identified by the EID. At Penn National, Pack said he has found no pattern in his database of necropsied horses suggesting a drop in claiming tag makes a significant difference in a horse's fatality risk. (The EID reported in 2012 horses dropping in price by $12,000 or less are 2.5 times more likely to suffer a fatal fracture; horses dropping more than $12,000 from their last start are three times more likely to break down.) He also didn't find a strong correlation between horses in his necropsy database and the veterinarian's list at Penn National, noting the crossover was only about 5 percent. “I've been in this business for a long, long time and it blew our minds away. For the first couple of years we thought, 'Oh it'll level out,' and then it didn't level out,” said Pack. While this information may be puzzling, Pack said it at least gives him somewhere to start as he works to understand more about preventing fatal injuries. And information is power. This entry was posted in NL Article, Ray's Paddock and tagged California Horse Racing Board, Dr. Jerry Pack, Dr. Laura Kennedy, Dr. Mary Scollay, dr. rick arthur, equine injury data, horse racing fatalities, kentucky horse racing commission, necropsy, NTRA Safety & Integrity Alliance, toe grabs, University of Kentucky Veterinary Diagnostic Laboratory, veterinary pathology by Natalie Voss. Bookmark the permalink.